Ciao! Buongiorno! Salve! What a great time we have had in Italy. For the last three and half weeks Marta and I have been staying with Marta’s parents, Fernando and Stefania who live in a small village called Visnà (good luck finding it on Google earth) 40 minutes north of Venice. They live on a beautifully manicured property bordered by a canal, there is a pond, various mature shade trees, a small fruit orchard and a vegie garden. Visnà is in the Treviso Province, which some of you may recognize from Treviso radicchio, that deliciously bitter red salad. Visnà is surrounded by fields laden with grapes, mainly prosecco but also some cabernet, merlot and little known raboso. It seems that just about every household has at least a few vines. Certainly every family has a large vegetable garden, being the end of summer they are laden with produce: eggplants, peppers, salad greens, and oh so many tomatoes. Every day has been planned around what we eat for lunch, dinner and breakfast. Generally, at the end of a long dinner whilst sipping homemade grappa and espresso Stefania can be heard to mutter quietly to Fernando ‘brioche domani’ meaning ‘pastry tomorrow’! Fernando has an amazing list of suppliers he calls on. Local butchers that specialise in particular meats, cheese producers, fishmongers and a huge array of local growers for fruits and vegetables. We have been to pick up freshly hand moulded buffalo mozzarella and ricotta filled burrata, so creamy and rich it just melts in your mouth. We had been summoned to the fonitore di pesce (the fishmonger) after Fernando has received an early morning phone call from the fishmonger stating “we have just got what you want, it was caught at 4am this morning”! We have been to pick up live fresh-water trout that are reared in the local river and fed prawns for the last month of their life. 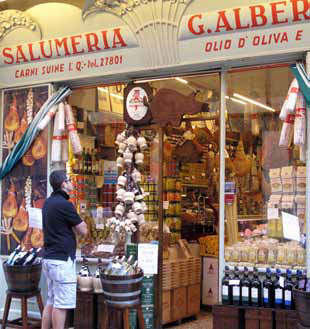 We have had salami, sopressa, prosciutto, the best speck I have ever had and amazing cheeses produced within a few kilometres. 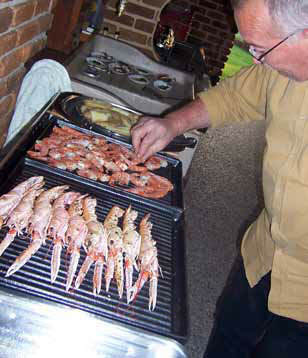 Pork ribs (addictive), beef fillet, chicken and quail have all been prepared, generally on the BBQ along with whatever is ready in the garden. The local butcher here also slaughters all the beasts that he sells with a couple of exceptions that do not come from this area. I have added 5kg to my body weight, but after India that doesn’t feel bad! 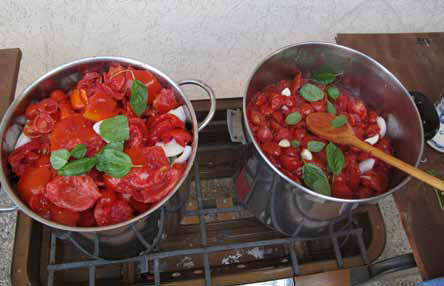 One of my favourite days was spent making tomato sugo. Stefania and I picked all the ripe tomatoes from the garden (probably 20 kg), of which at least half were cherry tomatoes. Every cherry had to be halved and then de-seeded, this apparently removes any bitterness and some water. Stefania kept a close eye on me to make sure there were no corners being cut. Every so often she would pick up a tomato I thought I had de-seeded and remove what I had left. We ended up with fresh tomato everywhere, now I understand why were doing it outside. With the fresh sauce we make a simple dish of spaghetti with sugo. It has to be the sweetest tomato sauce I have ever tasted, and one of the best pastas! We spent our time in Visnà in a very relaxed mode. Some days we headed to a lake not too far from there called Santa Croce. It is great to swim in and there are some well shaded and picturesque walking tracks. We dined at a fantastic rustic mountain hut serving wild deer with polenta, the four of us ate for 50 euro including wine! 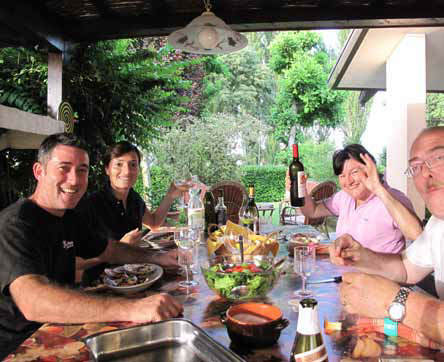 We spent time with friends at their beautiful seaside residence in Jesolo. We often went for bike rides in the afternoon, trying to work off lunch, and worked up an appetite for dinner, often failing miserably by ending up at a gelati shop in Oderzo. On other days we have visited Marta’s various friends, sometimes for a pizza, a gelati or just a coffee. We have dined at our favourite Italian restaurant in the foothills of Valdobbiadene, Gigetto (they even carry some Australian Stonier Wines!). Gigi is an absolute food legend, he must be 70 but still works every service. His ability to get through the night is assisted by visits to every known table for a small, maybe medium taste of their wine, just to make sure it is the way it should be! The food was great as always, think stuffed zuchinni flowers, fresh tagliatelle with porcini, duck tortelinni, fillet of local beef. Not far from Gigetto is a small osteria called Osteria Senza Oste literally meaning “bar without a barman”. It is a tiny terrace on the side of a hill surrounded by prosecco grapes and overlooking the original Prosecco area and Cartizze. There is a small hut with a fridge filled with prosecco, some glasses, fresh bread and sopressa and cheese. You take whatever you like and leave a donation. This takes rustic to another level, but the view makes it an experience we will never forget. We visited Florence to meet with my Uncle Peter and Aunty Margi who live in Boston for much of the year. It was so hot we went for long walks in the morning and then tried to take it easy and stay out of the sun for the remainder of the day, with frequent gelati stops. Florence is such an attractive city, full of rambling lanes, stunning architecture, piazzas, churches and restaurants. We had three great meals, all memorable for different reasons. Sitting in an old piazza we tucked into bistecca alla fiorentina, weighing 1kg and about 5cm thick, it was beautifully smoky and perfectly cooked. We visited a modern pizzeria and mozzarella bar situated in the courtyard of an old palace, great pizza and even better mozzarella. On our last day Peter and I spent a large part of the afternoon looking for an appropriate venue. We decided on a modern restaurant with a rustic/trattoria like feel. It was fantastic, traditional food, but executed with a fine dining touch. The standouts were tonno crudo and wild rabbit pasta. It was called Il Santo Bevitore for anyone visiting and it wasn’t expensive. To escape the heat we headed north to the Dolomites. In winter this area is classic skiing territory and in summer it is ideal for walking and getting away from the humidity of the lower areas. Being close to the Austrian border also influences the food; grain breads, hard cheeses, goulash, wurst, pretzels all being abundant. There are so many walking tracks of different grades and with varying landscapes. Many of the walks also have mountain huts along the route where you can have a coffee or lunch. Those who love walking should really consider a holiday in this region! We also ate several pizze at the local pizzeria Capriccio which we think are the best we’ve ever had! We concluded our stay in Italy with a short visit to the Cinque Terre. Wow! We found a lovely room in Manarola. La Vigna di Gigi was a great find and Gigi the owner truly made it an experience. Our room was right above the wine making room/cellar and vintage began during our stay. 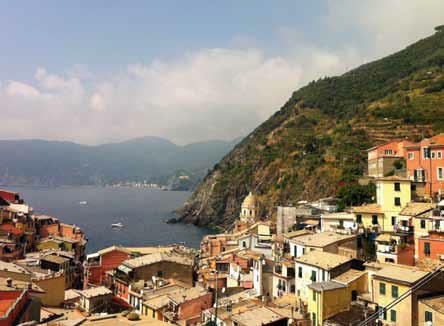 We spent two days trekking the Cinque Terre trails. There were breath taking views, rocky and difficult terrain broken by stunning little villages colourfully perched above the sea. The water is so clear and it was wonderful to spend all day in the sun without getting burnt! Nights are spent in open air restaurants, dining on amazingly fresh seafood, think seafood pasta with 8 types of seafood, fresh anchovies caught that day. Our favourite restaurant in Manarola was Trattoria Dal Billy, stuck into the side of the hill overlooking the coast, built over ancient terraces with lemon trees. A truly magnificent experience and one we will never forget.